Figure 1: Isoflurane's anti-apoptotic pathway. Note: Isoflurane increases sphingosine kinase activity, decreasing active Akt via phosphorylation of the Akt protein. Akt, when activated, cleaves caspase-3 and induces apoptosis. 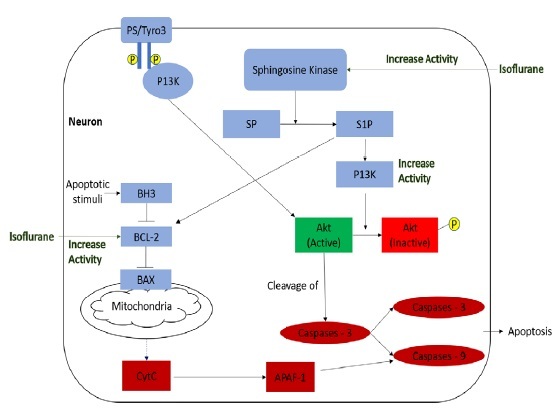 So, by decreasing the activity of Akt, less Caspase-3 is cleaved and promotes neuron survival. Isoflurane also increases the activity of BCL-2, which attenuates cleavage of caspase-9 and inhibits BAX. BAX is an apoptotic protein responsible for the expression of CytC/APAF-1 activation that cleaves of caspase-9, resulting in cell-death.8,10,11,15,17,41 CytC: Cytochrome c protein; APAF- 1: apoptotic protease activating factor 1; Akt: protein kinase B; BCL-2: B-cell lymphoma 2, apoptosis regulator; BAX: BCL2 associated X, apoptosis regulator; S1P: sphingosine-1-phosphate;PI3K: phosphoinositide 3-kinases.